The square sports display case got its start on a cold October evening in 1983. The Orioles played the Phillies in the World Series that year. Happily, Ken Rogers and his buddy John Graham had a couple beers and watched a game. John mentioned over the course of the evening that his wife no longer cared for his collection of over one hundred autographed baseballs. The collection itself didn’t cause the problem. His wife didn’t like that the baseballs overwhelmed the den. John only had round globe holders to protect his baseballs, and while they worked, they each needed their own space. That meant John’s baseballs simply couldn’t be kept neatly. If he couldn’t figure out a better way to display them, his precious baseballs had to go to the auction house. John needed a way to display his collection in a space-saving manner and protect the baseballs. So the two friends set out on a quest to build the best case possible for his treasured autographs. What they ended up with changed the way people all over the country protect their memorabilia. And, just like that, they created the BallQube square sports display case. Both accountants, John and Ken spent a lot of time thinking about rows and columns. That night during the World Series game, they had a flash of inspiration: why not bring the rows and columns into the collecting world? In fact, cube-shaped cases could be stacked in those rows and columns, saving an enormous amount of space. One shelf on the bookcase could now hold several times as many balls encased in square sports display cases. They sketched out their two-piece case idea on a paper napkin. And, just like that, they created the BallQube square sports display case. Soon after, Ken and John decided to leave the numbers game behind. The founders devoted themselves to making their dream a reality. They made prototypes and began taking them to baseball conventions and shows across the country. These men created another chapter in the American dream-start a business from the ground up and pursue your passion against all odds. 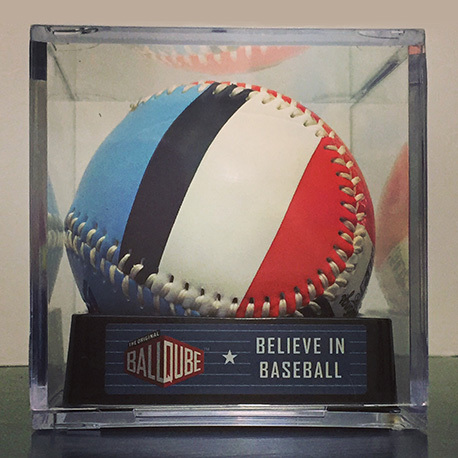 Collectors across the country quickly realized the superior logic and quality behind the BallQube cases. As the operation grew larger, Ken started looking to bring the manufacturing in-house. Notably, we’ve kept BallQube cases American-made since their inception in 1983. In fact, we’ve stayed in Texas since the very beginning. We even recycled presses from an old Ford plant in Detroit to use in making the cases. As years went by, the second generation of the Rogers family joined the team. This added BallQube to the long history of American multi-generational family businesses. Baseball, football, basketball, hockey are all deeply rooted in tradition. The experienced elders pass down wisdom, and memorabilia, to the young. Thus, we pass it all down: the stories, the legends, and the collections. And we’re here to help you preserve your memories for all the years to come. Today, we still live our family’s American dream of providing sports lovers with the quality sports display cases and service they deserve.